Howard University recently opened its new Barnes & Noble at Howard University bookstore, kicking off the partnership with an appearance by chef and author Carla Hall, co-host of ABC’s popular lifestyle series The Chew. The Howard alumna spoke about her passion for great food, met with fans and signed copies of her latest bestselling book, Carla’s Comfort Foods: Favorite Dishes from Around the World. Chef Hall is among an esteemed roster of Howard University alumni, a remarkable list that includes the late U.S. Supreme Court Justice Thurgood Marshall, the first African-American governor L. Douglas Wilder, opera singer Jessye Norman, and Pulitzer Prize-winning author Toni Morrison. When the store’s doors opened in April, customers found a completely refreshed inventory of merchandise, clothing, gifts and trade books. “Everyone was very excited to see the new products,” Scoggins reported, “but the store will be even better once the renovations are completed.” The soft opening offered only a preview of the surprises students will find in mid-July, when the store reopens after major changes. 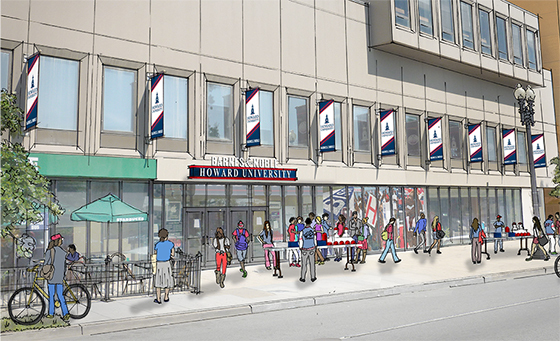 An artist’s rendering of the new Barnes & Noble College at Howard University bookstore, scheduled to reopen after the completion of renovations in July. On the store’s first level, a better traffic flow will bring visitors deeper into the clothing and gift department, where they will find an enhanced selection of merchandise, better placement of fixtures, and more space dedicated to Howard emblematic merchandise. The marketplace will be moved from the corner of the store to a site closer to the cash registers, making it easier for shoppers to pick up convenience items on their way out. An artist’s rendering of the interior of the Barnes & Noble at Howard University bookstore. As a premier historically black university, Howard is known as an authority and great supporter of African-American literature and authors. The bookstore reflects that commitment, offering a comprehensive selection of titles that reflect the rich history of African-American culture. “It’s very important to offer a wide selection of African-American literature, and our children’s department will also offer many unique titles that you might not find in any other bookstore,” explained Scoggins. While Chef Hall earned her degree in accounting from Howard University, her passion is for food. However, she still manages to apply lessons learned at her alma mater to her culinary career. 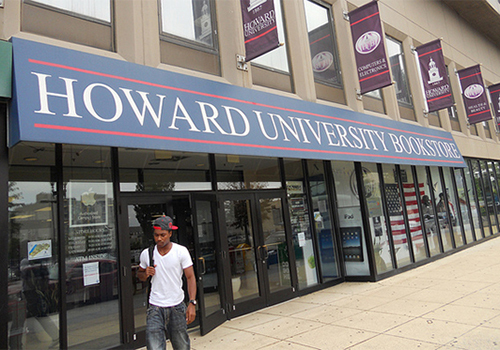 At the Howard book signing, Hall fondly recalled her days on campus. “I remember Dr. Thompson, who was my accounting teacher, who always instilled in us to do our best,” she said. Hall added that Howard taught her that life is all about being ready for the right opportunity, as well as being prepared for the moment; something she applies to her life every day. “I’m ready for the opportunity, and if I do what I love, I want to work at what I love,” she said proudly.